Formatting and Effects can be found on the fourth tab down on the right side of the Page Designer page. Let's take a look at the options available for formatting text, shapes, and images. 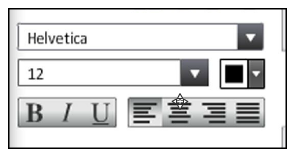 Each of the elements shown below were created with Page Designer elements and the Formatting features from the Format button on the right side menu. By changing the attributes of an object, such as color, size, alignment, stroke, and drop shadow, you can create many elements to suit your theme. Formatting text, shapes, or images is similar - click to highlight the object, click the formatting effect to apply. Indicates effects which can be used on Text (T)/Image (I)/Shape (S). Crop displays the image zoom/crop slider and also shows how much of the selected picture has been cropped. Image only. Red Eye Reduction is a tool to select portions of an image for red eye reduction. The placed image is corrected, but not the original. Image only. Use the slider bars and click wheel for visual feedback when changing effects. The spin button arrows to make precise changes on the Angle of the shadow. Each NEW element placed on the page uses these settings when Drop Shadow is applied. The effect will not follow from page to page. Use a Click-N-Go to create "saved settings". Enlarge your Page View using the zoom drop down menu so that you can read the text on your monitor. A new, unedited text box will contain "Fake Latin" text so you can find it on your page. Highlight and delete the default text and begin typing your own text at the blinking cursor. A text box with no text will display as a GRAY X. Click on the box to select it, then click inside the box and type your text. A text box that can not display all of the text will display a RED X. Click on the box to select it, then grab an orange ball handle to stretch the box to fit the text. To copy/paste an entire text element, use the Edit menu. To copy or cut/paste a specific line of text from one text box to another, highlight the original text, and use CTRL C or CTRL X (command key on Mac) to copy or cut. Then select the destination text box and use CTRL V to paste. Page Numbers are on all pages when your site is created, if you delete a page number, you can add it back. Click Page Number from the Place Text dropdown. Page Numbers automatically number when this feature is used and will renumber when pages are moved. Stroke places a thin border around the perimeter of the text box, not the text itself. Drop Shadow creates a shadow of the text. Font Typeface provides the list of fonts selected during setup (Plan > Fonts). Font Size changes the size of the text. When adjusting size, the text box may need to be stretched to fit. Add Fonts allows advisers to add additional fonts during the design phase. Justification aligns the text within the text box by flush left, centered, flush right, and full justified. Font Style (or weight) provides combinations of Bold / Italic / Underline text. Some fonts may not support certain styles. VERTICAL TEXT - Place a text box, tap the ENTER key between each letter to create a new line. Stretch text box vertically to clear the red X (and prevent a submission error!). 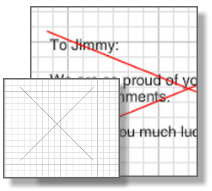 ANGLED TEXT - Place a text box, use angle degree at bottom of Formatting panel to change the angle from 0 degrees. You can also use the orange rotation handle at the top of the text box. 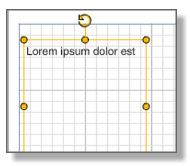 WRAPPED TEXT AROUND SQUARE OR RECTANGLE - Place text boxes on each side, use angle degree at bottom of Formatting panel to change the angle from 0 degrees. You can also use the orange rotation handle at the top of the text box. You can also use Text on a Path in the Advanced Text dropdown. REVERSE TEXT (light text on dark backgrounds) - Many people will use light text on dark backgrounds. Consider using dark text with a lighter text box fill on your dark background for readability. This works well on backgrounds of varied colors such as swirls and tye-dyes.